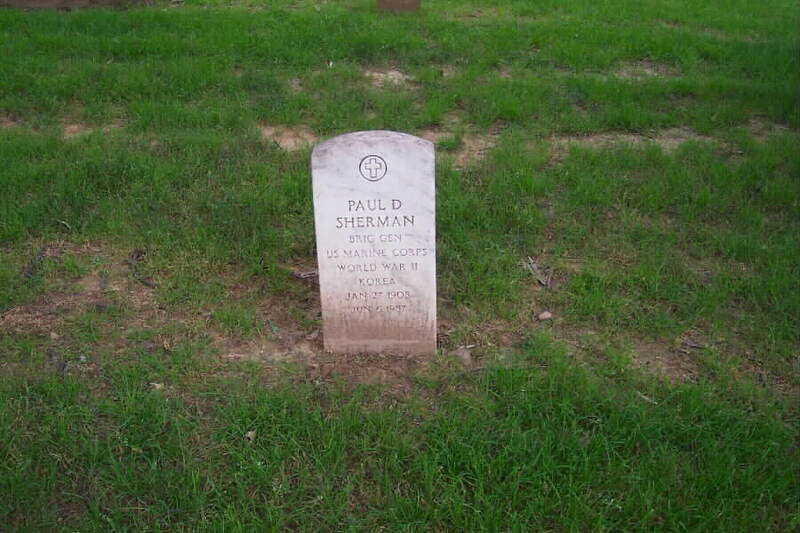 Paul D. Sherman, Brigadier General, United States Marine Corps. His training in the Marine Corps was supplemented by extensive training as lawyer. He was awarded Legion of Merit (Army) "...for exceptionally meritorious conduct in the performance of outstanding services as Naval Representative in the Allied Naval Command, Expeditionary Force Section, Supreme Allied Headquarters, Allied Expeditionary Force, from 27 September 1944 to 13 July 1945." Following courses of instruction at the Army and Navy Staff Colleges at Fort Leavenworth, Kansas and Newport, Rhode Island, and Washington, DC, and a course in the Army Air Force School of Applied Tactics, Orlando, Florida, beginning in early 1944, he reported to London for duty. Assigned to Staff of Allied Naval Commander, Expeditionary Force. He was born at Melrose, Massachusetts, January 27, 1908. He holds a BA Degree from Boston University, graduating in 1929, and a Law degree from George Washington University Washington, DC. He attended the latter University while on duty with the Judge Advocate General's Office in the Navy Department. He accepted appointment as a Scocond Lieutenant in the Marine Corps, October 4, 1929, and advanced to Colonel, August 14, 1954. Following completion of Basic School in Philadelphia, August 1930, he reported to the Naval Air Station, Hampton Roads, Virginia, for instruction. In September became a student aviator at the Naval Air Station, Pensacola, Florida. Upon graduation, he was ordered to the Naval Air Station, San Diego, California. Shortly after arrival in California, he was transferred to Scouting Squadron 15-M, Aircraft Battle Force, U.S. Fleet, aboard the USS Lexington, as Squadron Photographic, Personnel and Welfare Officer. In October 1932, he resumed his duties as a ground officer. He was first detached to the Orient in November 1932, and joined the 1st Battalion, 4th Marines, Marine Expeditionary Force, at Shanghai, China, in January 1933. In 1935, joined the Marine Detachment, Rifle Range, Wakefield, Massachusetts, and then the Marine Barracks at the Navy Yard, Washington, D.C. he was next assigned to the Office of Judge Advocate General, Navy Department, in June 1939 he went to sea aboard the USS Mississippi, as Commanding Officer, Marine Detachment, and as Legal Aide to the ship's Commanding Officer. He joined the 2nd Marine Division for first time in August 1941 as Aide-de-Camp to the Commanding General. Several months after the outbreak of World War II, he assumed command of 2nd Special Weapons Battalion and sailed with that unit on the SS President Monroe in November 1942 for New Zealand. He became Regimental Executive Officer of the 8th Marines in June 1943, and served in that capacity in the Tarawa campaign. He returned to the U.S. early 1944 to begin series of classes which preceded his assignment to Europe. In late 1945 he was named Officer in Charge, Discipline Division, and later became Office in Charge, Discharge Division, Personnel Department at Headquarters, Marine Corps. In October 1946 he went to Camp Lejeune, North Carolina, and became Camp Inspector. Again attached to 2nd marine Division in April of the next year as Division Inspector. Later he assumed command of 21st Marines and took part in maneuvers in the West Indies and served aboard the USS Kearsarge in the Mediterranean with that unit. He resumed duties as Division Inspector in November 1948. He reported to Headquarters, Fleet Marine Force, Pacific, Pearl Harbor, Territory of Hawaii in June 1949, assuming duties as Force Inspector and Force Legal Officer. Two years later, on June 27, 1951, he became Commanding Officer of the Marine Barracks at the Boston Navy Base. In addition to Legion of Merit, his medals include the Presidential Unit Citation with one star, Tarawa, 1943; Marine Corps Expeditionary Medal, China, 1933-35; American Defense Service Medal with Fleet Clasp, USS Mississippi; American Campaign Medal; Asiatic-Pacific Campaign Medal with one bronze star; European-African-Middle Eastern Campaign Medal, World War II Victory Medal. He was married to the former Katherine Maxfield. They had two daughters, and two sons. They resided at 4420 50th St, Washington, D.C. He was the brother of late Admiral Forrest P. Sherman, United States Navy, former Chief of Naval Operations. When he retired he was advanced to the rank of Brigadier General. January 27, 1908-June 6, 1987. He died on June 6, 1987 and was buried next to brother in Section 30 of Arlington National Cemetery.